If your ESL students know lots of animals, especially pets, but they need to practice the vocabulary in interesting context, try this guessing game ‘What pet have I got?’. Students will feel comfortable to speak English, even those with low self-esteem or shy, as they work in pairs. Can it …? ; Yes, it can. / No, it can’t. Has it got…? ; Yes, it has. / No, it hasn’t. Have you got…? ; Yes, I have. / No, I haven’t. 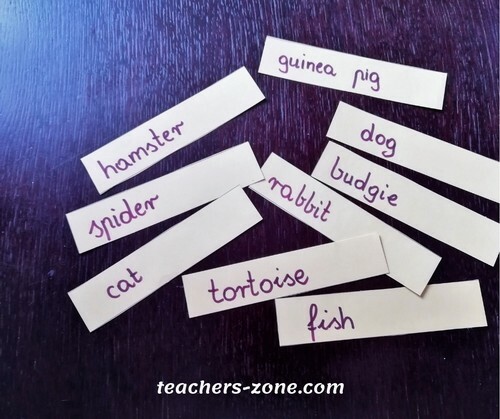 - Revise vocabulary for pets, body parts and verbs with your students if it is necessary. - Students work in pairs. - Distribute stripes of paper and pens and ask students to write some pets on them. Optionally you can prepare word cards with pets before the lesson. - Students put their word cards face down. - One student takes a word card (his partner cannot see what is on the card) and asks: What pet have I got? - The other student should guess what animal his partner chooses. He can ask three supplementary questions, using structures: Can it…? or Has it got…?,before he attempts to answer the question. Student A: Can it fly? Student B: No, it can’t. Student A: Has it got four legs? Student B: No, it hasn’t. Student A: Can it swim? Student B: Yes, it can. Student A: Have you got a fish? - If he spots the answer, gets a point and can take the word card. If he guesses wrong, the word card goes back on the table. - Students mix the cards and continue playing in turns. - Student who racks up more points / word cards is a winner. This guessing game you can organize as a whole class activity. In this case, one of the students chooses a word card and the rest of the class try to guess the pet. I hope you like the activity and find it useful and beneficial for your ESL students. Enjoy and leave a comment.